of our humanity before that condition or state. This commitment is reflected in the translation of our Scripture readings, the homilies, the music, and our prayers. Although some of the language may be unfamiliar, inclusive, expansive language is our attempt to express our evolving understanding of God, the Cosmos, and one another. The words may be disconcerting at first, but we hope you will find them liberating and inspiring. You may especially notice differences in: (1) The Creed, (2) Eucharistic Prayer, and (3) The Prayer of Jesus. The Nicene Creed was first adopted at the General Council of Nicaea in 325 CE. It was written using Greek philosophical concepts and in exclusive language. We have adapted a modern profession of faith that expresses in contemporary, inclusive language, the fundamental tenets of our Catholic faith. Rooted in the tradition of thanksgiving, remembrance, and celebration, we use contemporary language and theology in the Eucharistic Prayer. The beauty, power, and efficacy of language are upheld with even greater integrity as we find new and relevant ways to express our faith in light of contemporary scholarship and understanding. 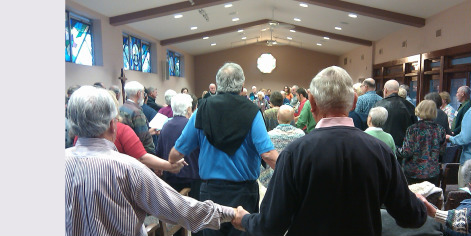 Also, the Eucharistic Prayer is divided into paragraphs or “Voices”, each of which is read by a different parishioner. Sharing the "Voices" ensures greater participation in the liturgy and reflects the priority of the presence of community for communion. Some Voices are, at times, spoken by community members fluent in languages other than English. An important reason for this practice is to emulate the universal dimension and experience of Pentecost. Hearing our common faith articulated in other languages also reminds us of our connection to the world-wide Church: we remember the whole Body of Christ. As we pray the Eucharistic Prayer and listen to the Voices, we reach beyond our own community and become a living symbol of connection and relationship inspired by the Eucharist table. The Prayer that Jesus Taught Us is found in the Gospels of Matthew (6:9a-13) and Luke (11:2a-4). The words and phrasing of the prayer are not identical in the two gospels, which indicates gospel writers may have known different versions of the prayer, or understood it as a model to use in prayer. It is also possible each writer took some literary license with the prayer as each knew it. Most modern scholars agree that the evangelists we know as “Matthew” and “Luke” were not eye-witnesses to the ministry of Jesus, and were not present when Jesus taught the prayer. The gospels were written in Greek. Any English version is a translation. Jesus' native tongue was probably Aramaic. We don’t even know with certainty in what language Jesus prayed this prayer (perhaps Aramaic or Greek). Throughout the last 2000 years, the prayer has been rendered variously and creatively. A good translation strives to capture not the literal interpretation, but the meaning. Good translation requires not only familiarity with the original language, but with the geography, history, culture and literary conventions of the time, as well as the context in which a passage appears. The translation of the “Our Father” currently recited in the Roman Catholic Church is not a verbatim rendition of either New Testament version of the prayer. You will find us using a contemporary version of this prayer in inclusive language. For further discussion on inclusive language issues, see also Frequently Asked Questions (pdf) and the Weekly Worship Aid.